The Intention Engine that powers these new tools in Paper provides a cool predictive technology which speeds up the creation of diagrams, charts and presentations. You can now rearrange shapes, create patterns and move anything with the Cut tool. The Fill tool supports freeform color fills for trend lines, pie charts and other smart objects. With Think Kit, users can now create diagram with a brand new smart pen which transforms circles, rectangles and triangles into smart shapes. It also let you draw straight lines and connectors between smart shapes. Here’s Think Kit in action. 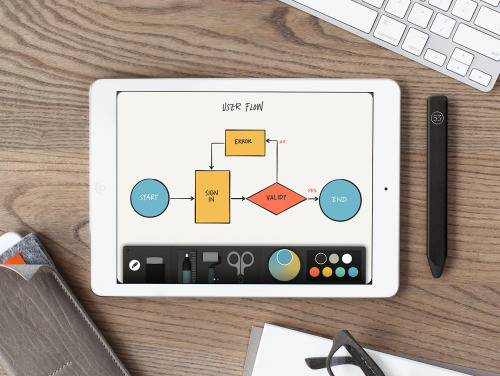 To go along with the new Think Kit tools, FiftyThree has redesigned Paper’s sharing functionality that now supports exporting of individual slides or entire workbooks in the format accepted by Apple’s Keynote and Microsoft’s PowerPoint. Recent Paper updates have implemented support for backing up journals in the cloud so you don’t lose your Paper data in case your iPad is stolen or damaged, added the Activity Center, a new place in Paper’s Mix service that collates all your social activity in one place and more. Diagram — A smart pen with style. Think Kit’s Diagram tool lets you draw objects, straight lines, connectors, and arrowheads. Cut — Rearrange and move shapes or words around on the screen. The Cut tool has a manual mode to draw freeform selection areas, or use Smart Cut to automatically select shapes without switching tools. Fill — Fill existing shapes with color, or draw new shapes with the color fills. Like the Cut tool, Fill has a manual and Smart mode, where you simply tap to fill a shape in with color. Presentation-Ready — Export your creations to PowerPoint or Keynote with our custom­-designed presentation templates that make your diagrams look great. Share Anywhere — Paper’s new sharing menu lets you open work in Paper in myriad other apps, including Trello, Slack, Dropbox, Box, and more. Export entire journals in PDF or PowerPoint format, or choose individual pages. Smart Shapes — Founded on years of scientific research, Intention Engine™ is our trademark drawing recognition and rendering system. It detects and corrects dozens of shapes sketched in real-­time – all while preserving the uniqueness and feel of hand-drawn lines. New scissors, brushes and other tools should come in handy when you want to quickly show an idea to a client, to your team or to a classroom full of students. The company recently raised a $30 million series B round of venture capital led by New Enterprise Associates to bring its tools to education and enterprise. 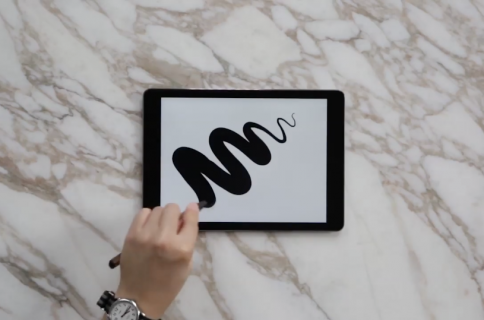 Paper integrates with Adobe apps and works best with FiftyThree’s own Pencil stylus, thought the app supports a number of popular Bluetooth styluses from other vendors as well.